Warm Apple Cider scented wax cubes from the Better Homes and Gardens line at Walmart! My warmer is also from the BH&G line at Walmart. It was a Christmas gift from Scott and Grayson last year and I love it! The wax melts usually run about $2, but you can often find them on clearance at the end of the season for $1! Do you have a favorite candle that doesn't have a wax cube companion? 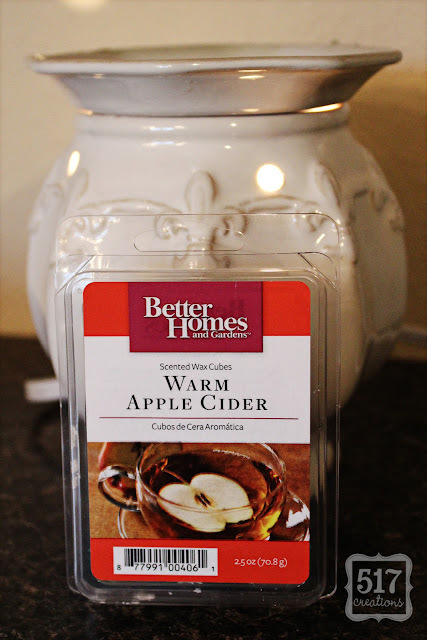 Vanessa over at this & that shares how to make your own wax cubes! This is my all time favorite scent, I will be devastated if they discontinue it! It was a little better last season, it was red and it tad stronger but it's still my fav! !